Rugged mountains, barren moorland, deep lochs and amber-coloured rivers create a majestic landscape dotted with Roman encampments, Iron Age settlements and grand castles. The Heart of Scotland, there are more things to do here than you can possibly count and many of the best places to stay in Perthshire certainly rival those in the cities or nearer the bright lights. This region is easily accessible from both Glasgow and Edinburgh yet seems a million miles from the frantic pace of city life. The Whisky Trail winds from the conservation villages in the south towards the Cairngorm National Park in the north. Golf courses, fishing, shooting, walking and cycling opportunities abound. The Scottish Crannog Centre (on Loch Tay not far from Aberfeldy), an authentic reconstruction of an Iron-Age loch dwelling, is a great spot for the whole family. Learn all about how people used to live in the area and take in the wide variety of exhibits. Whisky lovers are spoilt for choice in Perthshire, with both the Edradour Distillery and the more celebrated Famous Grouse Experience offering wonderful tours of their facilities (as well as tasting sessions to be enjoyed afterwards!). If whisky's not your thing then visit Cairn O'Mohr Fruit Wines in the Carse of Gowrie (between Perth and Dundee) for some wine and cider tasting. Scone Palace (situated just north of Perth), the original coronation site of the Kings of Scots, is a fabulous place to visit. Featuring splendid interiors, wonderful artwork and glorious grounds, you can also stop off for a tea and scone if you fancy a break. Our favourites amongst the best places to stay in Perthshire are either conveniently situated in the centre of a pretty town or hold a secluded spot deep in the beautiful countryside. Some reflect a new contemporary style while others are traditionally reassuring. Pitlochry is a great stopping off point, especially if you are on your way further north. It is a charming Victorian spa town which becomes a tourist magnet in the warmer months. Activity wise it offers the usual pursuits and in addition boasts the Pitlochry Festival Theatre which has earned international acclaim for high quality productions. 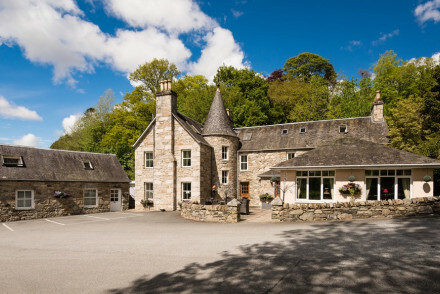 Just outside town, you'll find the Killiecrankie House Hotel. One of Scotland's hidden gems, it has been run for the last few years by Henrietta Fergusson who was previously in charge of the Carnegie Club at Skibo Castle. The welcome is very warm and the feel totally unpretentious. 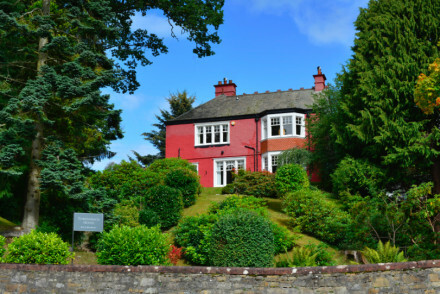 Add to this great food (2 AA Rosettes), homely bedrooms and enchanting gardens. For those who'd rather walk to the attractions, book a room at Craigatin House, a chic B&B in the centre of town. 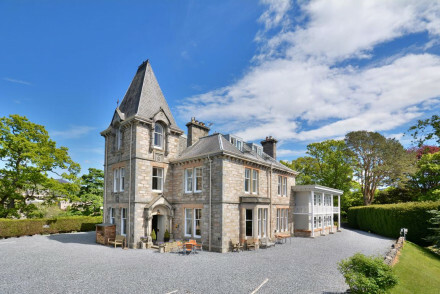 If you need a hotel with great food, then Perthshire has some great places to stay. 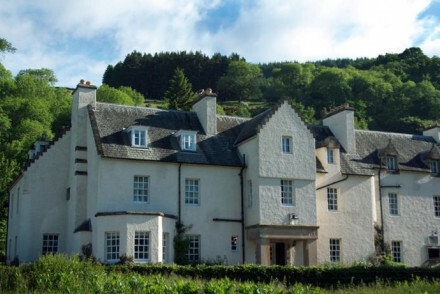 For award-winning fare, you really can't get much better than Monachyle Mhor near Balquidder, though be prepared for the four miles of single track road to get you there! The Crieff area too is a bit of a foodie hotspot with several great restaurants with rooms including Yann's at Glenearn House and the Barley Bree in Muthill. 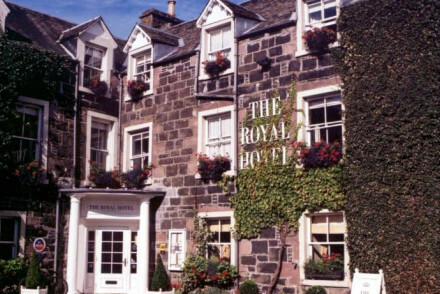 The Royal Hotel in Comrie also serves great grub and is an ideal base for bagging a few Munros. Mhor 84 boasts a wonderfully remote location and chic, unfussy accommodation. The food's divine and the setting's not bad either! 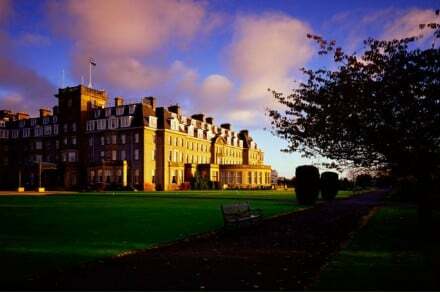 The famous Gleneagles Hotel is an absolutely top-notch stay - boasting elegant rooms, three championship golf courses, a spoiling spa, numerous activities and the only two Michelin-starred restaurant in Scotland! 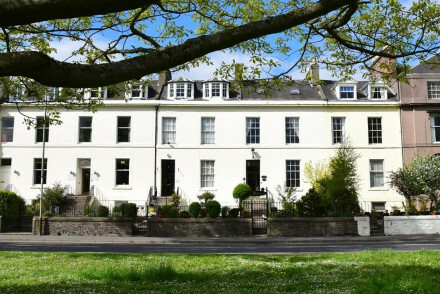 Ballathie House, overlooking the River Tay, offers elegant accommodation with some rooms featuring freestanding baths. Come back after a day out hiking to unwind by the roaring log fire and tuck into award-winning cuisine. 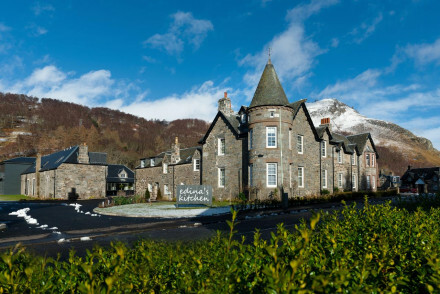 Aberfeldy's The Fortingall Hotel at the entrance to Glen Lyon should satisfy most traditionalists - offering chic, cosy accommodation and lovely grub made from local produce. Set in a lovely stately home, the family-run Kinloch House near Blairgowrie is another top option. Featuring traditional, elegantly decorated rooms and top-notch food, you're bound to enjoy a night or two spent here. 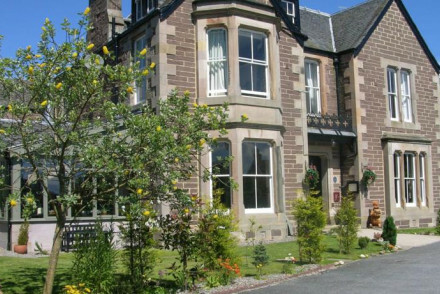 The Edwardian Torrdarach House is located just minutes away from a golf course, so is ideal for those wanting a truly Scottish getaway! The rooms are simple yet chic and you can come back after a day out to enjoy a tipple from the whisky bar. If you've decided that you'd prefer the privacy of a self-catering option then browse through the wide variety available online with our partner Booking.com. 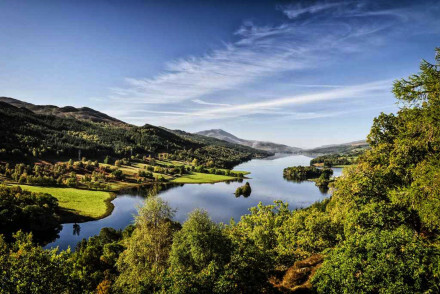 Best time to visit Perthshire for the weather is during the summer months, with the average daily temperature rising to 15°C in July and August. However, the region is always susceptible to rainfall so bring a jacket just in case! Fly into Edinburgh Airport, located about 50 miles away and served by plenty of public transport links to Perthshire. Alternatively fly into Glasgow Airport, it is a bit further away but also well connected to the region. 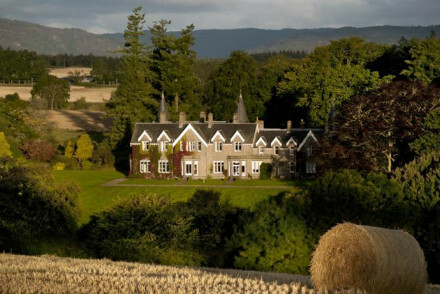 Browse through our list of the best places to stay in Perthshire. Widen the net to search through our recommendations for the best places to stay in Dundee, Edinburgh or Glasgow. Charming B&B in the heart of Pitlochry. Featuring three lovely rooms, the Roseburn B&B is a great spot for those looking for somewhere peaceful and quiet. A great launchpad for exploring this area of the Highlands. Local exploring - A great base for those looking to explore Pitlochry, the gateway to the Highlands. Sights nearby - Visit Killiecrankie, the sight of the famous Jacobean battle as well as the Soldiers Leap. A beautifully renovated country house set in rural Perthshire. Individually styled rooms perfectly mix contemporary and traditional styles with simple white walls, beamed ceilings, open fireplaces and modern bathrooms. An excellent restaurant serves up the best of Scottish produce. Fabulous. 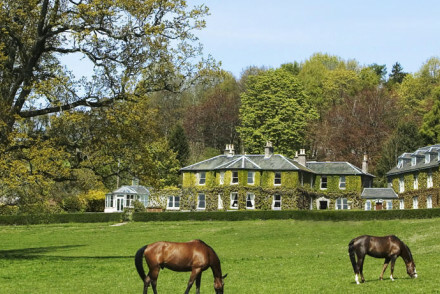 Country Escape - A secluded country house with access to numerous country pursuits. Fishing - Fly fish for wild Scottish Salmon on the renowned River Tay. 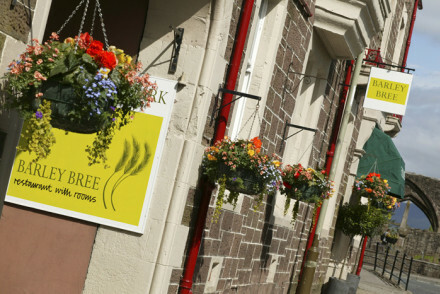 Offering charming cottages and lovely rooms, the Meikleour Arms is a delightful place to stay. Just a short walk from the river Tay, the hotel also features an excellent restaurant and a cosy pub that's a great spot to enjoy a dram. The cottages are perfect for a family holiday. Active Holiday - A great base for an active holiday of walking, fishing and horse riding. Families - The hotel's cottages are a great option for family trips. Fishing - The Meiklour Arms runs fishing trips on both the Tay and the Isla. Sights nearby - Take a trip to Scone Palace, the ancient seat of Scottish Kings. A family run small hotel set in the rugged highlands. Cosy interiors are traditional in style with antique furniture, richly coloured walls and chintz fabrics. The restaurant, headed by the owner, offers hearty fare ideal after a day in the great outdoors. A charming country escape. Country Escape - A traditional country house set in superb countryside offering warm hospitality and hearty cuisine. This Edwardian country house is surrounded by a well established wooded garden with a short walk leading to a golf course. Hearty scottish breakfasts are offered up including porridge with a dash of whiskey. The airy rooms, whisky bar, fireplaces and great views all lead to a relaxing stay. 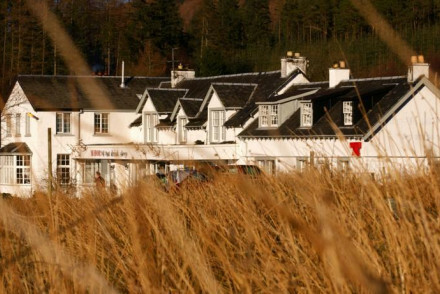 A remote hotel nestled between Loch Lomond and the Trossachs National Park. The combination of glorious natural surrounds and the chic, stylish interiors make for a memorable stay. Fantastic food produced from the best locally sourced, sustainable ingredients, served in an atmospheric dining room. Foodies - Foodie heaven- cusine from famed chefs Mhairi Taylor and Tom Lewis, as well as mushroom foraging expeditions. Back to Nature - The perfect launchpad for exploring the stunning lochs and parks of the surrounding area. Fishing - The motel will arrange boat, ghillie, permit and equipment for guests to fish for brown trout in Loch Doil and Loch Voine. Sights nearby - Any history buffs should check out the church at Balquhidder and visit the grave of clan leader Rob Roy. 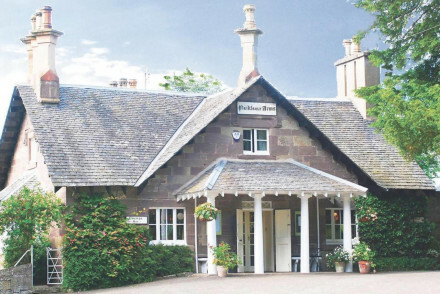 A charming restaurant with rooms in the heart of Perthshire. Contemporary rooms have simple clean design with gentle hues. The striking dining room, traditional in style, features a fireplace and exposed beams. An ideal base to enjoy country pursuits and excellent cuisine. Foodies - An award winning restaurant, in a charming traditional dining room, serving sumptious French cuisine from fresh local produce. Great walks - Numerous walks in the surrounding area through the stunning Perthshire countryside. Fishing - Coarse fishing, fly fishing and even sea angling all available nearby. Charming small restaurant-with-rooms in the centre of Crieff. Elegant bedrooms with large windows, feature wallpaper and spacious living areas. Excellent bistro styled french cuisine. A wonderful base to explore the local area. 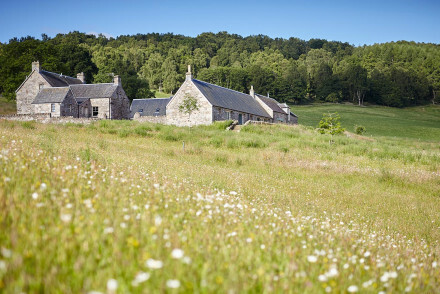 Back to Nature - A charming retreat in the heart of Perthshire, boasting stunning scenery and a host of outdoor pursuits. Great walks - Crieff has wonderful walking terrain, pack a lunch and head off for the day. Sights nearby - Visit Scotland's oldest distillery or Drummond Park Gardens. 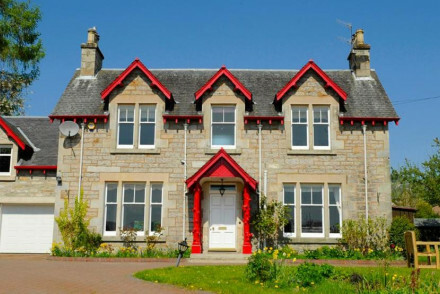 A couple of miles outside Pitlochry, Benvrackie is a charming, contemporary B&B. Featuring spacious, comfortable rooms with excellent ensuite bathrooms, the guesthouse is perfect for those looking for a base from which to explore the abundant beauty of the surrounding landscape. Sights nearby - Visit Killiecrankie, the sight of one of Scotland's most famous battles and the fabled Soldier's Leap. Great walks - The surrounding glens are full of beautiful walking routes. Fishing - Go fishing on the nearby River Tummel. A chic bed and breakfast in the heart of Pitlochry, with Farrow & Ball interiors and a lovely garden. Stylish contemporary bedrooms. Beautifully converted living areas with glass walls. Hearty breakfasts set guests up for a day outdoors. An excellent base for exploring the local area. Value chic - A stylish and affordable base to return to after a day exploring the nearby castles, mountains and whisky distilleries. Great walks - Walk around Loch Faskally and through the Faskally Woods. Sights nearby - Visit Blair Castle just five miles from the property. Quiet and unassuming, Brae House is lovely B&B on the banks of the Tay. Featuring comfortable rooms and a delightful sitting room in which to relax. It is a great spot for those looking for a relaxed place to stay in Aberfeldy. Local exploring - A lovely spot from which to explore Aberfeldy and the surrounding countryside. Fishing - Take a rod on the Tay, one of the UK's most famous salmon rivers. Great walks - Go walking along the banks of the River Tay. 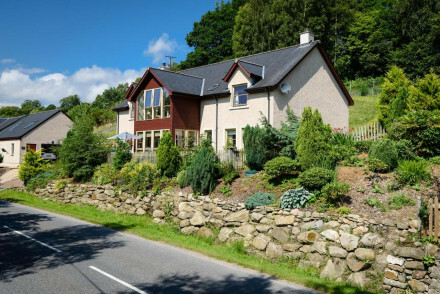 Set amidst rolling Perthshire hills, Ballintaggart Farm is a charming two bedroom B&B. Featuring pretty rooms, excellent food and a lovely sprawling garden, it's perfect for a countryside escape. Fishing - There is nearby Salmon fishing on the Tay and the Garry. Great walks - The surrounding area is full of lovely walking trails. Originally a coaching inn from the 1800s, this historic, stylish property offers six ensuite rooms softly furnished in rustic, earthy tones. Wonderful location in the heart of Perthshire. Come for hill walks and stunning views followed by drinks in the cosy bar and locally sourced hearty food. Tucked away in a hidden corner of Perthshire, Cuil an Duin is a charming B&B. 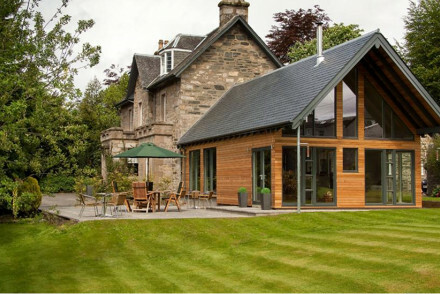 Featuring smart, comfortable bedrooms, a characterful piano and beautiful sprawling garden, it's an ideal base to explore the gateway to the Scottish Highlands. Fishing - Excellent salmon fishing on the nearby Garry and Tay rivers. Great walks - The surrounding area has no shortage of great walks. 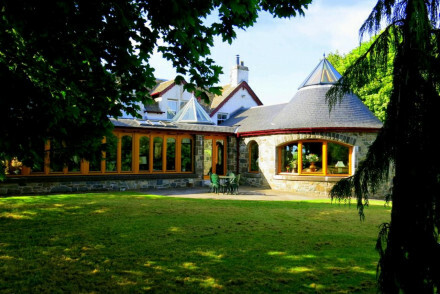 Set in a lovely house overlooking the glens surrounding Aberfeldy, Errichel House and Restaurant is a delightful guesthouse offering luxury cottages as well as delightful rooms. Errichel is a great spot for those looking to explore the beautiful countryside surrounding Aberfeldy. Sights nearby - Visit Killiecrankie, the sight of the famous redcoat Soldier's Leap. Local markets - Go into the Aberfeldy country market on Sundays. 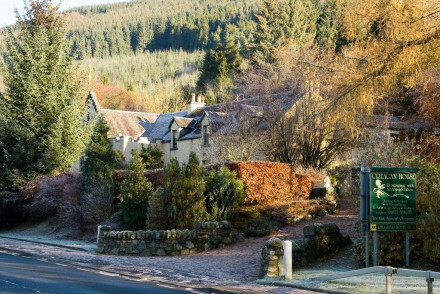 Offering beautiful views of the Tummel Valley, Knockendarroch is a charming, picturesque hotel in Pitlochry. Each comfortable room has a distinctive Scottish feel and the hotel's excellent restaurant focuses on local produce. A great gateway into the Highlands. Sights nearby - Visit nearby Killiecrankie, the site of the famous 'Soldiers Leap'. Great walks - The surrounding valley is full of beautiful walking routes. Charming small hotel in the heart of Perthshire. Elegant rooms, some with four poster beds, antique furniture and traditional artworks. Wonderful Scottish cuisine served in a cosy dining room. 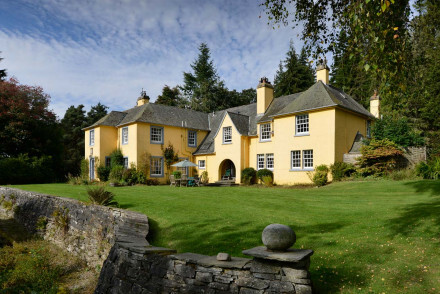 A charming country house well positioned to access this beautiful corner of Scotland. 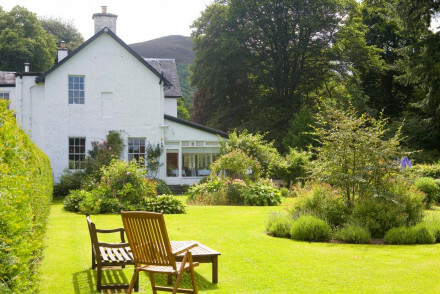 Local exploring - A charming country house, yet in a town, near Loch Tay and Pitlochry. Great walks - Find both local walks from the door and the Monroes for the more adventurous close by. Fishing - On the River Earn. A union of rustic warmth and funky sophistication, in the heart of Rob Roy country. Modern rooms with crisp design, modern art and lovely contemporary bathrooms. An award-winning restaurant plus an abundance of outdoor pursuits make this the ideal country escape. Utter heaven! Foodies - Inspired and award-winning cuisine, lovingly crafted from fantastic local produce, most of it straight from their own farm. Country Escape - A charming country house, with a healthy injection of avant-garde interior design, set in 2,000 acres of blissful silence. Great walks - Endless trials through and around the Loch Lomond and the Trossachs National Park. Fishing - The trout-rich Lochs Voil and Doine are at the bottom of the driveway. Lovely country house in beautiful Perthshire. Traditional cosy rooms with large sash windows and oh-so comfortable beds. A sitting room with a roaring fire to sink into, with a whisky, after a day outdoors. Stunning cuisine with the emphasis on local produce. The perfect country escape. Active Holiday - At the gateway to Scotland and with ample choice of outdoor activities right on the doorstep from hiking to shooting and biking. Country Escape - Cosy up by the fire, eat hearty traditional fare, venture into the great outdoors and collapse onto your cosy bed. Fishing - Salmon fishing on the Rivers Lyon and Tay, and trout fishing on Loch Farleyer and Loch Kinardochy can be arranged. Great walks - Endless choices of walks whether it be an amble around Fortingall or a day excursion covering four Munros. 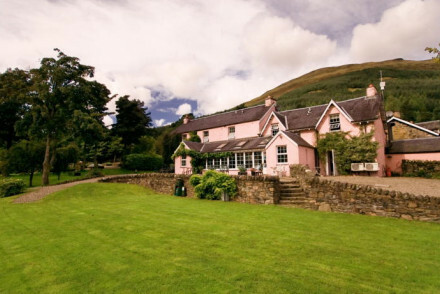 A quaint and charming Highland hotel, wonderfully unassuming and Scottish through and through. Snug sitting rooms, traditional rooms and fantastic restaurant complete with tartan chairs! 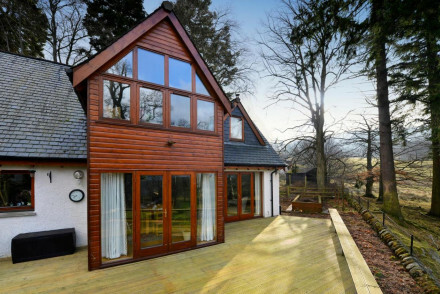 Set in stunning landscapes, with direct access to the Pass of Killiecrankie. A characterful country escape! Hideaway - The ideal getaway from it all spot, with warm fires, hearty food, comfy beds and miles of picturesque walking. Great walks - Plenty of walking in the local area with Loch Tummel, Rannoch Moor and the magnificent Glenshee. Views - Great views over the Pass of Killiecrankie.